Kumihimo tools and supplies. 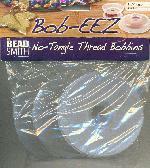 Including S-lon thread, discs, rattail, bobbins and kits for the Japanese form of braid-making. For additional rattail see Beading Cord and Thread. We also have Magatama Japanese Seed Beads.